Oh my goodness, Room 207 – we are very popular! We think the VoiceThread will work now so give it a go from home. Don’t worry if it doesn’t work – we’ll try from school. The VoiceThread is embedded below and I’ve also included the direct link to the VoiceThread as well. Don’t forget that it’s not just Thailand Celebrations they would like to hear about. You can share any celebration that you and your family may do every year. You might also like to include your favourite celebration from a country that you used to live in. Making a Connection with Madrid! A class of 3rd graders from ASM (American School of Madrid) would love to connect with us! Isn’t that exciting? They have made some “Children of the World” books that they would love to share with us, and they would love it even more if we left them some comments. Scroll down to find the posts that have Children of the World in the title. Click on the title and you will be taken to a blog post by a 3rd grade student. Leave them a comment and don’t forget to include your blog URL in the comment so that they can visit your blog! Well, here’s the final video – we did it! 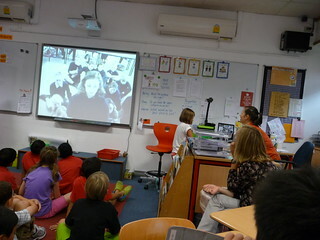 We dotted ourselves around the world – 17 countries and over 30 classrooms took part! Keep an eye out for your dots and your PreK buddies’ dots! They are ALL spectacular and each and every one of them made me smile! I hope they make you smile too! What’s even more special, is that Mr Peter Reynolds (yes, the author of The Dot) left me a comment on my blog about the video – I’ll show you it tomorrow morning! 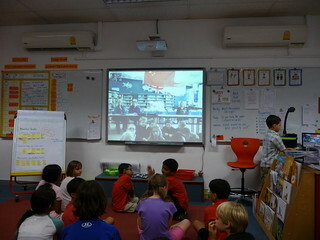 Yesterday Room 207 skyped with a school in Australia, Hawkesdale P12 College in Sydney. The students were a little older than us. They were 11 years old and in Year 5/6. 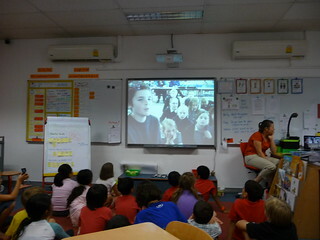 It’s fun to skype with a class in another country because we learned new facts about that country, it’s interesting to meet new people, and to hear how different other people talk. 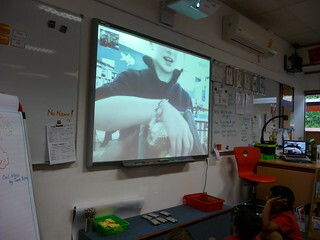 We learned that the students in Australia put a spread called vegemite on their sandwiches. (Ms H said she would bring some in for us to try during International Week). They have lunchboxes and we have a cafeteria instead. There are animals on their money – a kangaroo, and an emu. We had to ask what an emu was – it’s like an ostrich and it does not fly. It is rainy season here in Thailand right now and we showed them the temperature using Ms H’s phone. 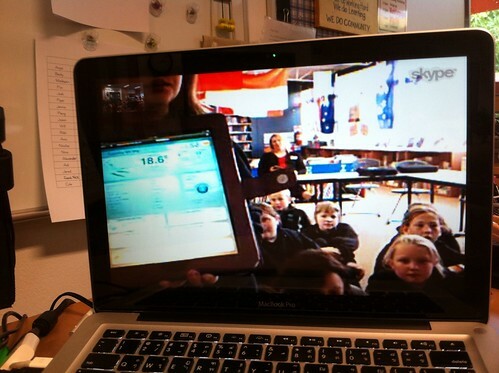 Our temperature was 25 degrees Celcius and the temperature in Australia was 18.6 on Mrs Mirstchin’s ipad. Hawkesdale P12 College is taking part in our Dots Around the World project. Tjhey are going to use Doodle Buddy to make their dots. We’re looking forward to seeing their dots. They have 5 ipads for their class. Piper did a great job as photographer yesterday and Jenna, Rikki & Will (helped by Jered & Ana) were fantastic videographers. Ms H will edit the film and share it a bit later.